What happens once you get into a conversation with a random person by talking “With” them? You bring in Jury talk. A style of talking which is quick and to the point. Answering a question with a long winded response takes away from the conversation. Keep answer relatively simple. So to allow the other person to feel in control of the conversation. 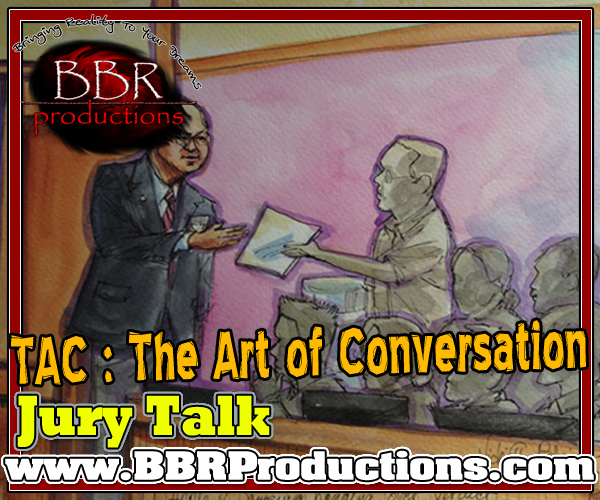 With Jury talk you are controlling the conversation with your answer’s direction. Example of a Comedian wanting to start a conversation with another person. Begin the conversation using “With, Not to” then jump into “Jury Talk”. Scene is waiting on line at the supermarket. It would be awesome if they invented conveyer belts for humans that go along with the conveyer belt for food. People would enjoy that wouldn’t they? Oh I am sure. Anything for lazier. Who me? Not my specialty. Do you perform around this area? On occasion, Yes I do. Take the conversation where you want to go, but keep it simple and to the point. Be playful, or direct. Connect with the person. Once they start asking you about your life then redirect it away from personal. It is about business, and relationship building. Even if for a moment of time. Because then it is practicing networking. Which would be two of your three needs of success! Great, and many thanks for the, example! Because I want to be clear, if someone does persist in peruit of personal questions in spite of consistent redirecting back to professional/business/playful banter, is there a point when it would be best to find a non-insulting excuse toward escape- say going to get a cup of tea or pardoning oneself for a trip to the poweder room? Thank you again for the “keep it light, playful” direction! Your blog, this week especially, is informing me in a direction I appreciate! !